We’ve stepped into the future with a lot of interesting technology. Smart cars save us fuel and keep us connected while we drive; smartphones put a mini-computer with incredible processing power into our pockets. Now, smart scales are making it possible for us to take control of our health and weight in a way that makes sense – with advanced technology! Like any piece of technology, there are many different smart scale options on the market. Huge variations exist, so let’s break down the top five products that you should consider while getting your health back under control. How to Use a Bluetooth Scale? Are Bluetooth Scales Compatible with Fitbit? Are Bluetooth Scales Better than Analog? 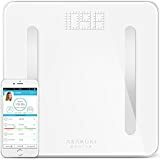 This Bluetooth scale is an affordable, multi-user scale that helps you calculate important health information and sync it to your favorite fitness trackers with ease. This Bluetooth scale made by RENPHO is one of the best Bluetooth scale options. It is able to track 11 different metrics for more than one user. It calibrates well, meaning that you get accurate weight readings every single time. It has a sleek design and is easy to clean when necessary. Smart App Syncs with Fitness Apps - Over Millions happy global users, RENPHO App syncs with APPLE HEALTH, GOOGLE FIT, and FITBIT APP. Free Friendly App - Download RENPHO app for FREE at App Store/Google Play. RENPHO App works with Bluetooth 4.0, supports Android 4.3 & IOS 7.0 or above system. Local Customer Service - 100% Satisfaction Guarantee & Local U.S. Customer Service based office. 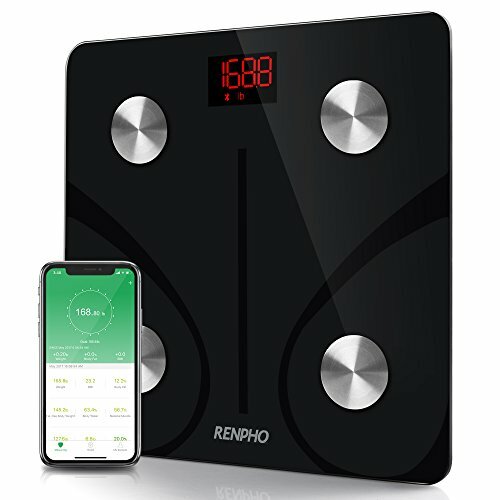 The ease of Bluetooth connectivity is the standout feature of this RENPHO scale. Set up takes only a few moments, and then you will be connected to the RENPHO app on your phone. From here, you can keep track of 11 different metrics: weight, BMI, body fat, water, skeletal muscle, fat-free body weight, muscle mass, bone mass, protein, basal metabolism, and body age. Another great thing about this scale is how simple it is to sync the data for multiple users. Each user must have a separate phone, but all you have to do is weight yourself, and the data will be kept separately on each user’s device. This makes it a great option for families and couples. Some of the metrics measured by the scale may not be accurate for every user. While the scale is equipped with electrodes to measure body fat and water percentage, the calculations for bone mass and protein are more questionable. Additionally, while the multi-user functionality is a great bonus, you have to make sure the data syncs before the next person weighs themselves. Otherwise, the scale may get confused about which weight it is recording and save the data incorrectly. The HoooWooo Bluetooth Bathroom Scale is a mid-priced Bluetooth scale that comes equipped with the fastest Bluetooth technology currently on the market. You’ll be on, off, and tracking your updated health stats in no time with this scale. The design of this particular Bluetooth scale is highly focused on those who put health in a high priority position in life. From the design to the features to the precise measurements it can give you, this scale might be a great fit for those who truly want to live their healthiest life. This digital scale has safety tempered glass platform, low battery and overload indicate. The best thing about this scale is how easy it is to connect to your phone and how quickly you can take your personalized measurement. The high-speed Bluetooth connection takes less than three minutes to set up. The scale will recognize multiple users, so you simply step on the scale, let it read your data, and go on your way! Data is automatically recorded to your phone. The scale itself also has a very streamlined design. It has an auto on-and-off feature, so you won’t waste battery, and the low battery light indicates when you need to change them out. It’s easy to switch between different units of measurement with conveniently placed buttons. Plus, the glass tempered base design can stand up to a lot! The biggest downside of this scale is the weight limitation that it has. While technically someone of any weight can use this scale, the manufacturers have disclosed that it is only guaranteed to take precise measurements for weights within 330 pounds. For heavier individuals who are hoping to get fit, this won’t be a good choice. 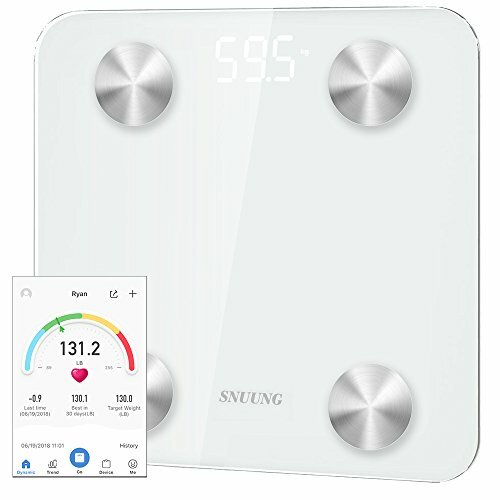 One of the most technically developed smart scales on the market for its price, the SNUUNG is an affordable scale choice for those on a fitness journey. This inexpensive scale is a great tool for tracking any fitness journey. It measures weight, BMI, body fat, and more on the related app as well as in a number of other health apps you can use. Additionally, it can work with multiple apps which is something you do not find in many smart scales at this price point. FINEST QUALITY MATERIALS: Sensitive electrodes, 6mm tempered glass platform and high quality ABS plastic. SIMPLER AND ELEGANT LOOKING: Product size: 11" x11" x1"; Hidden design: HD LED display makes more concise appearance. 4 HIGH PRECISION SENSORS: High precision sensors measure in increments of 0.2 lb / 0.1 kg with 400 lbs / 180 kg capacity Setup. 8 PRECISION BODY MEASUREMENTS: Body weight, Body Water, Body fat, Muscle mass, BMI, Calorie, Bone Mass and Visceral Fat. COMPATIBILITY: Android 4.3 or above; IOS 7.0 or above; 4.0 Bluetooth. Auto recognition of up to 8 users' profiles. 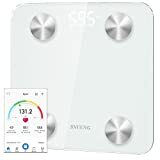 The most standout feature of this scale that cannot be found on many Bluetooth scales in the same price range is its data syncing capabilities. In addition to having its own app, the scale can also send data to phone-based health such as LG health. This makes it more convenient than ever to keep up the fitness journey you are already on. Users who choose to use the scale’s app are generally pleased with the various trend views available. Data can be viewed on a weekly or monthly basis, so fitness lovers can view their fitness journey in any type of personalized view that they would prefer. The biggest problem with this scale is that the body fat measurement is not accurate for all body types. In fact, it’s hard to clearly say when it is accurate and when it is not. Largely, it is at least consistent, so you can rely on the overall trends even if you can’t rely on the exact values shown in the app. Additionally, this scale really needs to be used on a hard rather than a carpeted floor. This might not be an issue for all users, but you live in a very carpeted home, it might be hard to find somewhere that you can get a good read on your health statistics. Otherwise, you won't be viewing your health situation accurately. 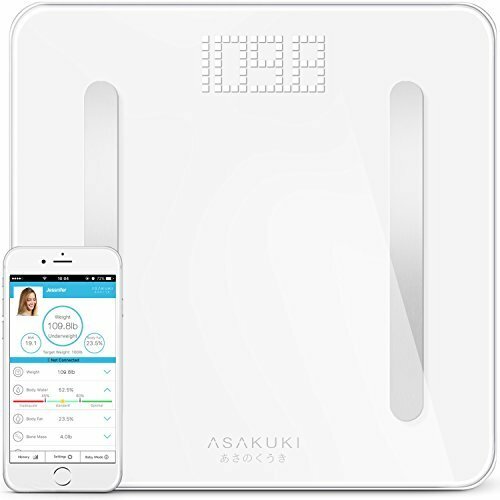 The ASAKUKI is a mid-range, Japanese-made digital smart scale. The delicate intricacies of the scale make it very accurate and worth your consideration. This specific body fat digital scale has a very sleek design and a large, an LCD monitor which displays weight, measurements, and other fun info in a simple view. Additionally, ASAKUKI has released a paired app that is easy to connect to. The app can be used to view calculations made based on your changes in weight. Two great things about this scale are related to how easy it is to use. First, the screen is easy to read. It’s bright, it lights up quickly, and it has a large display. Second, the Bluetooth functionality and app are easy to use. Connecting is as simple as opening the app. Additionally, the scale measures a number of useful metrics such as BMI, body fat percentage, body mass, and bone density while it weighs you. These are all recorded in your app for easy trend tracking. You can even save profiles for up to 12 different people! A big drawback with the BMI tracking within the app is the scale of BMI ranges that it uses. Because this product was originally made for and marketed in Japan, the BMI ranges are set to a different standard than used in the United States or other countries. So, you should consider this when the scale indicates that you are under or overweight. Additionally, the readings like the muscle and body fat percentage reading are not as consistently accurate as the weight-related readings are with this scale. 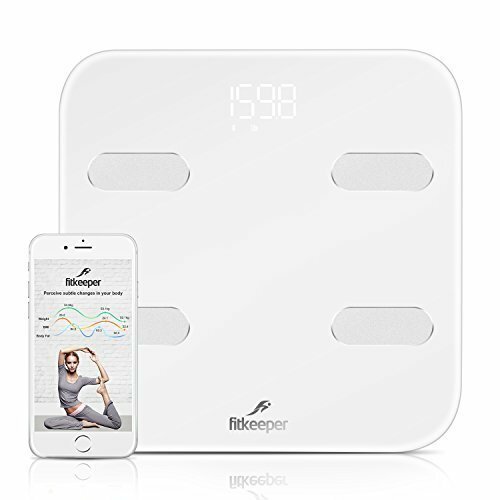 The Fitkeeper Smart Body Scale is a mid-range smart scale that tracks up to 14 different metrics to help you learn more about your body during your fitness journey. 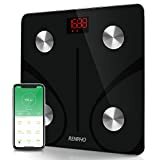 Like all smart scales, this scale can pair up with your phone, and this one has a particularly streamlined connection process that is very thoroughly explained. Once set up, you can simply step on the scale, and the app will record weight and all of the other metrics. All metrics can be seen on long-term growth charts to help you get a bigger picture of your fitness journey. Best Body Health Monitor: Smart body fat scale with super simple operation, easy to set up and use. Monitor your health index at any time, get rid of excess fat, control the body health by yourself. APP Data Analysis: Up to 14 body composition data, easy to track your body health information about Body Weight, Body Fat, Body Water, Muscle Mass, BMI, BMR, Bone Mass, Visceral Fat, Protein, Physique Rating, Fat-free Body Weight, Subcutaneous Fat, Skeletal Muscle and Metabolic Age. Fitkeeper Warranty: Any defective of the workmanship or product function, refund or replacement would be available. Any question with the product will be responded within 24 hours. The sync process is very simplified with this scale. Simply download the app, enable Bluetooth, and turn on location services. That’s it! You’ll be able to record your weight and other measurements simply by standing on the scale from then on. The scale itself has a very nice design that will fit in with the decor of many different rooms in your home. While looks aren't the most important thing is a scale, it might be good for those who really care about the aesthetic in a room. Even when the readings are slightly accurate (which will be touched on in the ‘The Bad’ section below), the measurements are still consistent. This means that you can still use the growth charts to get an idea of what is trending up and what is trending down. And trends are the most important thing when considering these measurements! Some of the measurements do not always get a perfectly accurate reading. 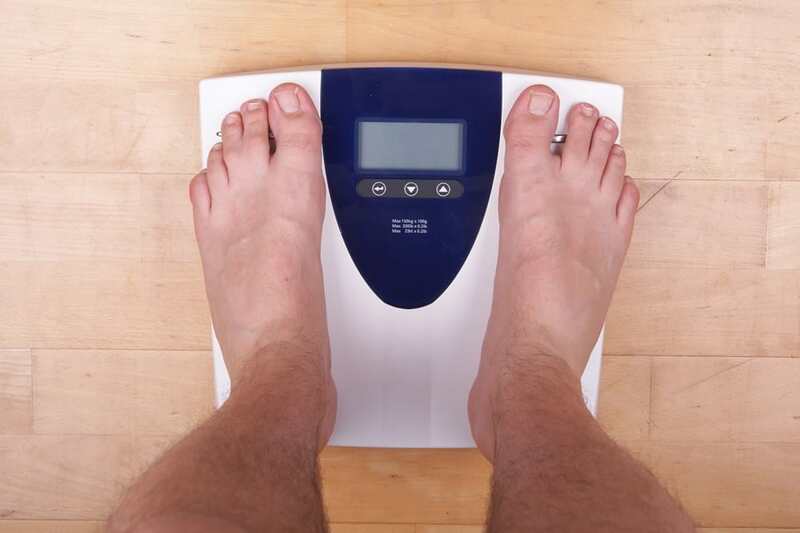 Some things, like body fat and muscle mass, are notoriously difficult to measure on a smart scale and are only accurate if you step directly on the sensors with slightly damp feet. Thankfully, measurements are still very consistent even if not completely accurate, so you can still use the growth charts. The English on the app is not perfect. It is being improved over time as users report errors, but it’s important to know that this product is manufactured in a non-English speaking country, and the English reflects that at times. Smart scales are a new type of product that not everyone is familiar with, and that can make shopping for the perfect product for you home quite difficult. To get the best deal, you need to know what you are looking for. With smart scales, the most important details are as follows. App compatibility is absolutely necessary for a smart scale to be useful. If you cannot connect it to some type of app on your phone, what is the point the scale being Bluetooth enabled? There are two types of app compatibility when it comes to smart scales. Some scales have their own app which they connect to. When you step on the scale, measurements are directly recorded into the app and calculations about your body’s statistics are done from there. Other scales are able to send weight, BMI, and other data to other fitness apps. These smart scales are typically more expensive, and there are often more issues with this type of connection. Not every app records data in the same manner, so it can be complicated to get this functionality properly set up. Most people prefer a scale that comes with its own app if they are new to the fitness world. This gives them a place to start without feeling like they’re already behind. If you are buying a smart scale to kick-start your fitness journey, choose a scale with its own app. If you already care about your fitness and track it using an app on your phone, find a smart scale that is compatible with the app you already use. Why fix what isn’t broken? Are you the only person in your family that works out? Or is the whole family getting ready to go on a fitness journey together? If your family is all hoping to reap the benefits of a smart scale, you will want to find a scale that is multi-user enabled to make everyone’s journey a little bit easier. Multi-user scales can keep track of weight and body statistics for multiple people either in one phone’s app or on each person’s individual phone app. By having a scale with this capability, you are able to get more bang for your buck since everyone can use the same scale. As you probably already know, not every app is made to work with every device! Some apps only work on the latest Android system. Other apps can work on nearly every OS out there. Before you buy any smart scale, look up the app in question and ensure that it is compatible with the operating system that you are currently running on your phone. A smart scale won’t be very useful if you can’t get the app needed to sync your information to your phone! Check Bluetooth version and phone compatibility before making any final decisions. It seems a bit obvious, but how much accuracy you need is very important to consider when looking at smart scales. Are you a competing athlete who needs to know their precise body mass percentage and water weight percentage? If so, you will need a high-end model that has the best quality sensors to ensure that you are getting accurate readings. This type of scale can be difficult to find. Are you on a personal fitness journey and more interested in progress than accuracy? If so, you will want to look for a scale that is consistent, even if it has some degree of error. As long as your scale is measuring you consistently, you will be able to track your overall fitness journey accurately. Like any other piece of technology, a smart scale can malfunction. Sometimes, it’s because of a manufacturing error. Other times, user error causes things to act up. Regardless of what issue arises, you will be frustrated if that does happen – especially if you don’t have a warranty. A warranty can be an incredibly important thing in these situations. No one wants their new tech gadget to break within a week of buying it. Choosing a product that includes a limited-time warranty will help relieve stress if this type of situation were to occur. Using a Bluetooth scale is very simple. Every scale will, of course, have its own particular functions, but the user manual included with all scales should help you figure things out. Every scale will be a little bit different, but this is the basic outline of how you can expect a Bluetooth scale to work. The instructions in the app or included with the scale should give you a more detailed look at each specific scale’s sync procedure. Bluetooth scales can be as accurate as any other scale when it comes to measuring weight. They are all accurate – to a degree! Adding Bluetooth capabilities to a scale does not affect its abilities to measure weight. Instead, the addition of Bluetooth simply allows the scale to communicate any measurements it takes to your phone or other devices. Generally speaking, most low-to-mid-range scales are not compatible with Fitbit. They will not directly connect with your Fitbit and record measurements. That being said, there are some high-end scales which are specifically made to work with your Fitbit and other fit technology. If you have a specific device you are hoping to use with your smart scale, reach out to the device’s manufacturer and ask them if they have any scale recommendations. Do you simply want to check your weight every now and then without worrying about batteries or other technology? Then you will likely prefer using an analog scale. Do you want to learn more about the health trends that your body is going through with the help of technology? Try out a smart scale to take advantage of these possibilities. 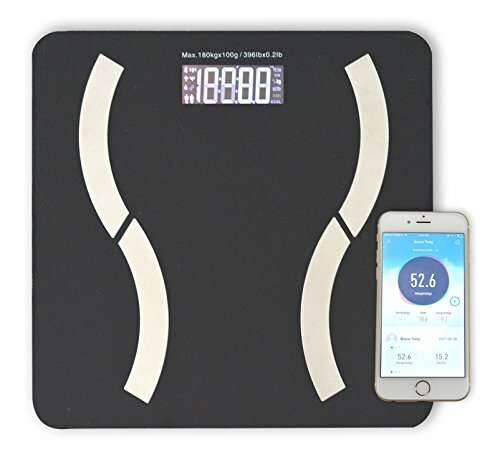 Among the best Bluetooth scale options on the market, the RENPHO Bluetooth Body Fat Scale is the best scale for most users because of its simple connectivity, multi-user functionality, and the number of accurate measurements it produces.